Normally one does not cite the index. Normally. There are three declarations of intention on page 55 in Hancock County, Illinois’ volume 4 of those records. 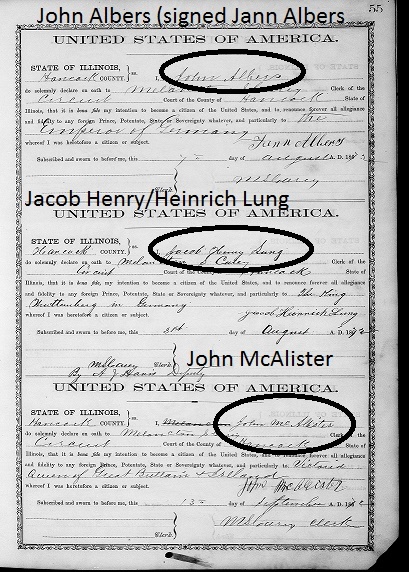 John Albers, Jacob Lung, and John McAlister appear as having made out a declaration in 1872. I was reasonably certain that the Jann Albers was actually Jann Albers Fecht, but there was no way that conclusion could be drawn based solely upon what was on page 55. Until I went and looked in the index. I really wasn’t even looking for his name in the index. Given the number of relatives I have in Hancock County, I was just looking at the index for any name that I recognized that I had not yet researched. And there was an entry in the “F portion of the index–an index that was created by the court clerk. 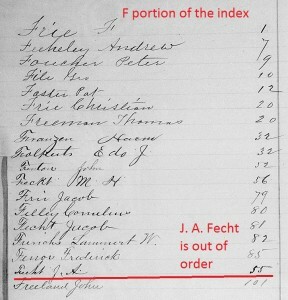 The other entries in the “F” section of the index are in page order-except for J. A.Fecht. His index entry is not in order, leaving the impression that it was some how written in later. The only entry on page 55 for which it really fits is Jann Albers. Sometimes one has to use the index as a clue. 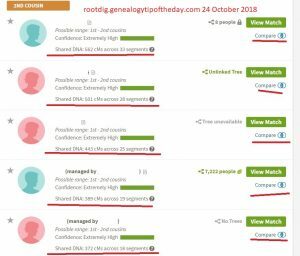 In this case, I’ll have to include a citation to the “F” section of the index as well as that’s what actually provides me with the last name for Jann’s entry in the naturalization register.